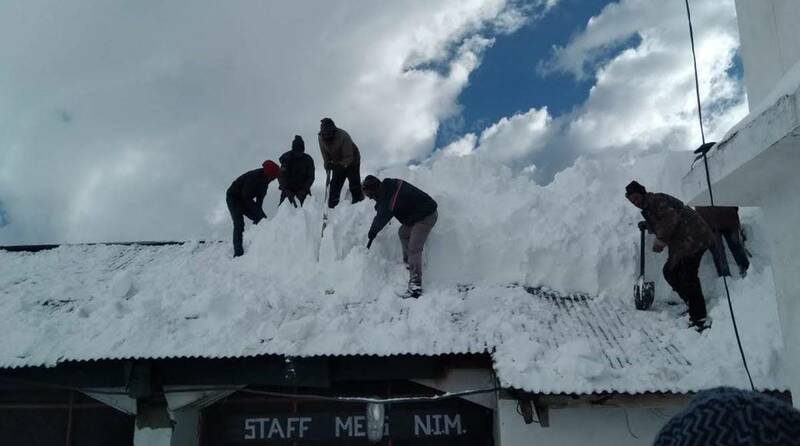 Reconstruction team clearing snowfall from atop the staff mess in Kedarnath. With a fresh spell of snowfall, the temperature in Kedarnath has dipped to the lowest of the season. The hill pilgrimage town registered a minimum of minus 15 degrees Celsius on Friday. Earlier, on 13 January this year, Kedarnath had recorded a minimum of minus 13 degrees Celsius. With about 10 feet of snow, the town located in Rudarprayag district offers a challenging situation. With no electricity, mobile network and water supply, the reconstruction team and policemen presently staying in Kedarnath suspended outdoor activities to stay inside their room on Friday. Even the trek route from Gaurikund remains blocked due to heavy snowfall. Kedarnath has received a heavier than usual snowfall this season. Locals say the snowfall situation is like it was in 2014. The reconstruction team is presently involved in construction of houses for priests, a safety wall, Sarswati river ghat and Sankarcharya Samadhi restoration work.